It turns out that the real plan for Haiti’s northeastern region — especially the Caracol Bay area — is one that was hatched by Canadian mining corporations, with the U.S. and South Korean sweatshop zone being a side project and distraction. If this mining plan is given a green light while Haiti is under foreign occupation, it will permanently strip the country of much of its mineral, cultural, and ecological wealth. Dominican Republic Pueblo Viejo mine on August 7, 2009; one would be hard put to find deforestation due to charcoal production that looks quite as bad as this (Credit: Mining Journal). In a recent interview with Canada’s Financial Post, Majescor Resources Inc. CEO Dan Hachey was effusive about Michel Martelly’s installment as president because he expects Martelly’s policy of mimicking the Dominican Republic (DR) to be a boon to the mining sector. “thirty years ago, there was no mining sector to speak of in the Dominican Republic…. “In that short period of time they’ve seen the development of the Pueblo Viejo Project [of Barrick and Goldcorp's], which is one of the world’s largest gold deposits — and is pretty much a neighbour of ours. This glowing picture omits the fact that Barrick and Goldcorp have come under strong popular opposition in the DR. In a country where 20% of the population lacks access to drinking water, these companies are accused of polluting 2,500 cubic meters of water per hour with the vast quantities of cyanide needed to process 24,000 tons of ore a day by opencast (or open-pit) mining. Open-pit mining is banned by the European Union. 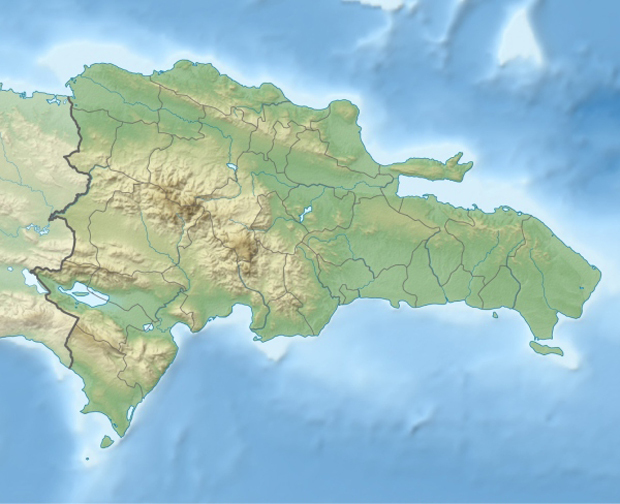 Activists in the DR have joined forces with a broader group called Observatorio de Conflictos Mineros de América Latina (OCMAL) that has launched a campaign to end this practice in the region. There is great concern that the DR’s biggest water reservoir, which is close to the mining operations, is continuously at risk of cyanide contamination, since stories of spills and massive fish die offs caused by mining companies are legion. Barrick and Goldcorp have also been accused of dynamiting mountains and destroying Taino Indian archaelogical sites. 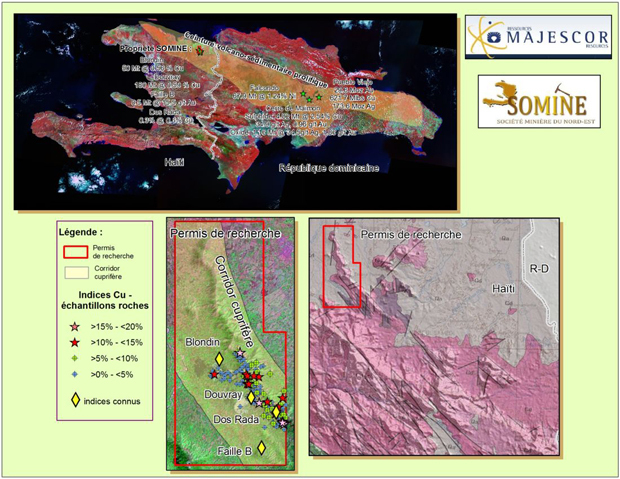 SOMINE is an acronym for Société Minière du Nord-Est S.A. and is described in the mineral trade sheets as a “Haitian affiliate mining company.” It is 66.4% owned by Majescor, with the rest being owned by Haiti’s elite. Majescor is still a relatively small company that conducts mineral surveys. The SOMINE property is surrounded by other mining properties owned jointly by Majescor and much larger concerns like Eurasian Minerals and Newmont Mining. Once Majescor’s surveys are complete, it plans to find a big partner, like Barrick, Eurasian, or Newmont to handle the extractive part of the project. “the 1970s by the UN Development Program, with some very good results [but the project was not pursued, then] there was a feasibility study done by the Germans [Bundesanstalt fur Geowissenschaften und Rohstoffe (BGR)] in 1980, and there was further drilling done in the 1990s by Canadian junior [mining companies]. recalled Hachey. During the 1980′s, the area was explored again by the UNDP and also surveyed by the French Bureau de Recherches Géologiques et Minière (BRGM), both of which reported finding only copper. The official story is that an abundance of copper had until recently obscured the fact that the area’s ore is also rich in silver and gold, and this was discovered from Majescor’s recent prospects of Douvray, Blondin and Faille-B. However, the story could just as well be that the mining executives were biding their time and waiting for a “stable” non-nationalistic government to take effect before initiating their projects. The mineral rights to the area were assigned to SOMINE under a Mining Convention executed on May 5, 2005 (valid until March 9, 2020) between this company and the post-Aristide coup government. After this, it did not take long for Haiti’s mountains to start to glitter. For example, an exploration of the Faille-B prospect in 2007 found a gold vein that averaged 42.7 grams of gold per ton of ore (g/t) over 6 meters, including values of 107.5 g/t of gold over one meter. 0.3% copper over 12 meters, including 0.61% copper over 1.5 meters; 154 grams of silver per ton (g/t) over 12 meters, including 869 g/t silver over 1.5 meters. 16.9 g/t silver over 113 meters, including 6.2 g/t silver over 1.5 meters; 0.43% copper over 113 meters, including 4.44% copper over 1.5 meters. 277 g/t silver over 13.5 meters, including 1,428 g/t silver over 1.5 meters; 0.18% copper over 13.5 meters, including 0.52% copper over 1.5 meters; 0.04 g/t gold over 13.5 meters, including 0.04 g/t gold over 1.5 meters. These highly concentrated deposits of copper, silver and gold should reasonably represent a new found wealth for Haiti at a time of dire need of resources for the country’s reconstruction. But if the DR is to serve as an example, Haiti will not benefit from its minerals. 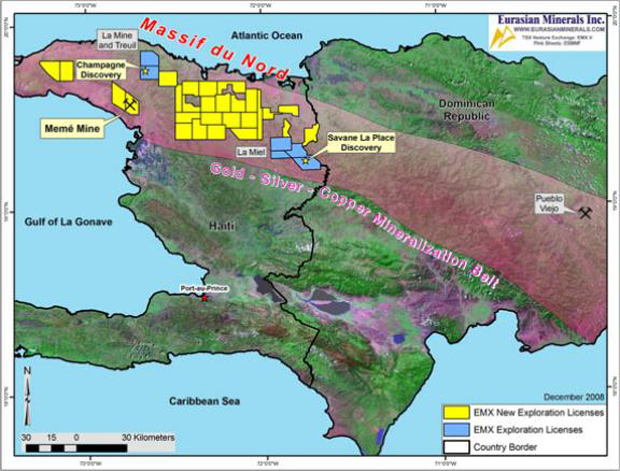 In the DR, Barrick owns 60% of the Pueblo Viejo gold mine and Goldcorp Inc. owns the remaining 40%. To get a sense of the scale of the greed, one need only consider that currently the Pueblo Viejo mine is slated to produce one million ounces of gold per year at a cost of only US$20-50/oz, making it one of the lowest-cost gold mines in the world. “What we’re most excited about is that we found some silver which was never really realized before. It’s the first silver discovery in Haiti. “Part of the reason why it was never really discovered was that historically there was so much copper prevalent — there’s a lot of outcropping at surface. The people who did the work before did not do much testing, even for gold. 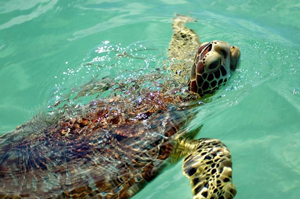 only 15 kilometres from the SOMINE property and near Cap-Haïtien. This first official announcement of a deep-water port for Caracol explains in part why there has been no effort to mitigate the ecological effects of the massive free-trade (sweatshop) zone inaugurated in March 2012 in that area: the textile factories’ contributions to the degradation of Caracol Bay should be trivial compared to the damage from opencast gold mining and construction of a deep-water port. Monday May 7, 2012 (Le Matin) Martelly announces that the construction of a port will soon start in Fort-Liberte [near Caracol], in the Northeast. The port will cost U.S $179 million and is supposed to be “built with the U.S. government’s help,” but it will likely be entirely owned by U.S. concerns.